Kendrick Lamar, on stage at the Coachella Valley Music and Arts Festival in Indio, Calif., on April 23, 2017. 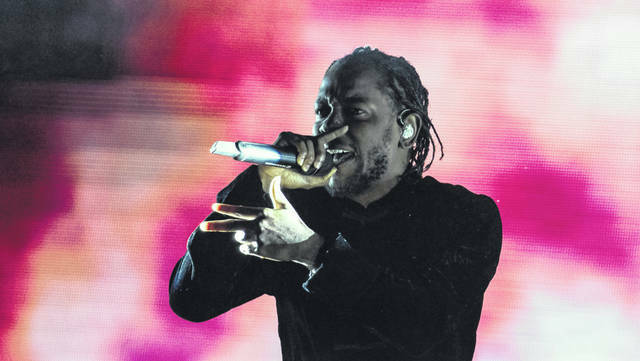 Hip-hop continues to dominate pop music, rock keeps sliding, Taylor Swift appears to be falling off, and hip-hop giants Kendrick Lamar and Drake are solidifying their grip as the planet’s dominant pop stars. Those are the broad strokes that can be gleaned from the nominations announced Friday for the 61st annual Grammys Awards. Love or loathe them, the Grammys continue to be a barometer of broad commercial trends in American music. Hip-hop and pop dominated the album of the year nominations, while rock failed to garner even one mention. The nominees included rappers Cardi B (“Invasion of Privacy”), Drake (“Scorpion”), Post Malone (“Beerbongs & Benleys”) and Lamar (“Black Panther: The Album”), R&B artists Janelle Monae (“Dirty Computer”) and H.E.R. (“H.E.R.”), country-pop singer Kacey Musgraves (“Golden Hour”) and singer-songwriter Brandi Carlile (“By the Way, I Forgive You”). Lamar led the way with eight overall nominations, Drake had seven, and Carlile and producer Boi-1DA (who has worked with Drake and Cardi B) garnered six each. Carlile may be the biggest surprise, with her nominations in three major categories including album of the year as well as song and record of the year (“The Joke”). The singer has released seven well-received, musically eclectic albums, but had never won a Grammy previously. The Recording Academy considered recordings released between Oct. 1, 2017 and Sept. 30, 2018. The 2019 Grammy Awards will be nationally televised Feb. 10 on CBS-TV. Notably excluded from the top categories was Swift, who had dominated the Grammys for years. She has garnered 10 awards and is the only woman to win album of the year twice. But her chart-topping 2017 album, “Reputation,” album was snubbed other than a nomination for best pop vocal album. Another notable omission from the top categories was singer Ariana Grande, whose “Sweetener” album is shaping up as one of the year’s biggest commercial successes. In the always confusing best new artist category — which isn’t really about a “new” artist so much as one who may have been obscure for years before making a commercial impact — the nominees ranged from genuine newcomers to veteran road warriors who finally broke through. One of the nominees is Greta Van Fleet, whose debut album, “Anthem of the Peaceful Army,” was released too late for Grammy consideration, though the Michigan band had played festivals — including Lollapalooza in Grant Park — on the back of a pair of 2017 EP’s and a major-label marketing push. The nomination kept rock artists from being completely shut out in the major categories. On the flip side of that equation is best-new-artist nominee Margo Price, who has been releasing independent music since 2010. The singer finally broke through with “Midwest Farmer’s Daughter” in 2016 and amplified that success with “All American Made” in 2017. If a brand-new-artist nomination can be categorized as “long overdue,” Price qualifies. The rest of the best new artist nominees included Chloe X Halle, Luke Combs, H.E.R, Dua Lipa, Bebe Rexha and Jorja Smith. Besides Carlile, the record of the year nominees included Cardi B, Bad Bunny and J Balvin (“I Like It”); Drake (“God’s Plan”); Childish Gambino (“This is America”); Lady Gaga and Bradley Cooper (“Shallow”); Lamar and SZA (“All the Stars”); Post Malone (“Rockstar”); and Zedd, Maren Morris and Grey (“The Middle”). Among artists with Chicago connections, the nominees included Fall Out Boy for best rock album (“Mania”); Kanye West for best producer, non-classical; John Prine for best Americana album (“The Tree of Forgiveness”); and Jeff Tweedy for best American roots song (Mavis Staples’ “Build a Bridge”). In jazz, Miguel Zenon’s “Yo Soy La Tradicion” (“I Am Tradition”) featuring Chicago’s Spektral Quartet, received two nominations, for best Latin jazz album and best improvised jazz solo. Chicago Symphony Orchestra composer-in-residence Missy Mazzoli was nominated for best contemporary classical composition for “Vespers for Violin.” And “Liquid Melancholy: Clarinet Music of James M. Stephenson” — an album by CSO assistant principal clarinet John Bruce Yeh — was nominated for best engineered album, classical (engineered by Bill Maylone and Mary Mazurek). Tribune critic Howard Reich contributed to this report.